PEOPLE in Donegal are being invited to express their views on the proposed extension of the greenway infrastructure of Derry-Strabane and Donegal County Council areas. 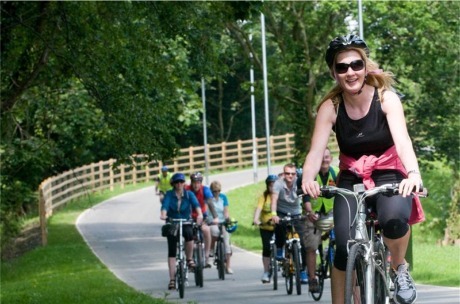 The North West Greenway Plan has been developed by the sustainable transport charity Sustrans, and commissioned by the North West Regional Cross-Border Group. The Plan identifies a series of recommended greenway routes and a new map has been drawn up as a result of research and initial consultations with a view to opening up new ways of connecting the region. The plan has now been formally adopted by Derry City and Strabane District Council and is being considered by Donegal County Council for inclusion into future delivery strategies. A leafy section of Derry's Urban Greenway. To date over 1,000km of cycling/walking provision has been delivered across both council areas. The vast majority, 940km, of routes are on road with 80km traffic free, 30km of which are classified as high quality greenways. Mayor of Derry, Cllr Elisha McCallion, said: “The ongoing development of the greenway network has opened up many areas across the district making them more accessible to local people. And the potential links with our neighbouring council area in Donegal make the network a valuable tourism asset for both border areas." The new plan seeks to extend the traffic free provision and the study will also serve as a tool for other stakeholders interested in developing greenways. To view the plan online and share your thoughts and views please go to www.derrystrabane.com .